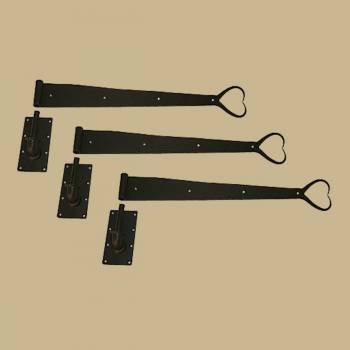 3 Pintle Strap Door Hinge Heart Tip Black Wrought Iron 34"
(3) pieces Surface Mount Pintle Hinge: Used for doors & shutters the pintle is affixed to a plate allowing for easy surface mounting. The accompanying strap has a curled barrel & can easily be removed from the pintle plate making removing doors or shutters that much easier. Crafted of Wrought Iron this hinge is a fabulous detail for that Old Colonial charm. Our exclusive RSF coating protects this item for years to come. Screws for strap & pintle plate included.